Set up an effective video monitoring system within minutes! 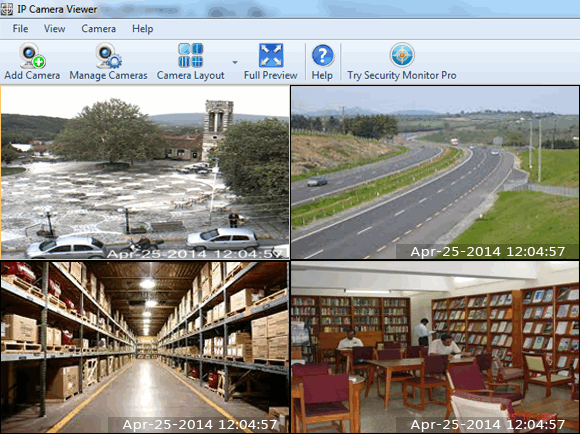 IP Camera Viewer allows you to view live video from your IP cameras or Webcams on your PC. This software allows you to set up an effective video monitoring system within minutes! Monitor your home, office, parking area or anywhere you need security. Over 2000 different IP camera models from leading camera manufacturers are supported. Supported brands include Axis, Canon, D-Link, Foscam, Panasonic, Mobotix, Pixord, Sony, Toshiba, Vivotek and many more. Virtually all USB cameras work with IP Camera Viewer. You can control and view up to 4 camera feeds simultaneously. IP Camera Viewer allows you to arrange and group your cameras and view them on a single screen. You can change the arrangement and preview layout of the cameras for your security needs. Make the live video clearer by adjusting camera image and video properties such as resolution, frame rate for USB cameras and saturation, brightness, contrast for IP Camera and Webcam. Is your camera mounted upside-down or is its preview tilted a bit? IP Camera Viewer supports many PTZ (Pan/Tilt/Zoom) enabled network cameras so you can get the image you need.